I discovered my passion for the ice when I was five years old. Our neighbor would take us skating at the Cumberland arena after school. She saw how driven and fast I was for a five year old and told my parents about speed skating. We had never heard of speed skating before in our area so we decided to try it out when I turned six. Speed skating combined two things I loved, ice skating and going fast, or what I thought was fast at the time. I spent the next three years speed skating. I moved up quickly in the categories and was doing well but started to have some frustration, and as a result, I decided not to enroll in the program the following season. Instead, I spent the next winter learning how to alpine ski race with my older brother. During the ski season I realized that something, a feeling, was missing. The next season I decided to get back into speed skating. In the winter of 2004 and 2005 I was eleven years old and I told myself that if I was coming back I wanted to be the best. Instead of being disappointed when I would lose in races, I found motivation to work harder. If somebody else could do something, then there was no reason that I could not do it too, if I worked hard and tried my best. Some people said I was stubborn and others told me that my goals were too big. All I could think to tell them was that there was no point in doing something if you do not plan on giving it your best effort. Even today I tell myself I want to be the best. The only difference is that now I know it doesn’t come overnight and that there is still alot of work to be done. My first proudest achievements were qualifying for the Canada Winter Games and winning a Silver Medal. Vincent De Haître won his first medal at the ISU World Single Distances Championships in 2017, taking silver in the 1000m. He followed it a day later with a near-podium in the 1500m, ending up in fourth place. 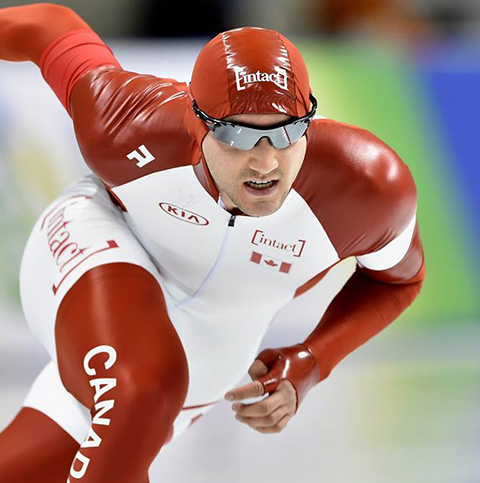 At the ISU World Sprint Championships at the end of February, he broke the Canadian record in the 1000m. I have been following a skating training system set up by my coach. This includes structured training workouts, weight training and race support. During the winter, we have access to coaching support 7 days week. We have coaching and Team Manager support at all major races. I am being trained and monitored through a structured training system designed by our coach and support staff. Training includes strength training, interval workouts, training zone evaluations, video analysis and monitoring of training and racing by the coach. We worked on individual and group skills relevant to Long track speed skating. Graduate of École Secondaire Béatrice-Desloges. 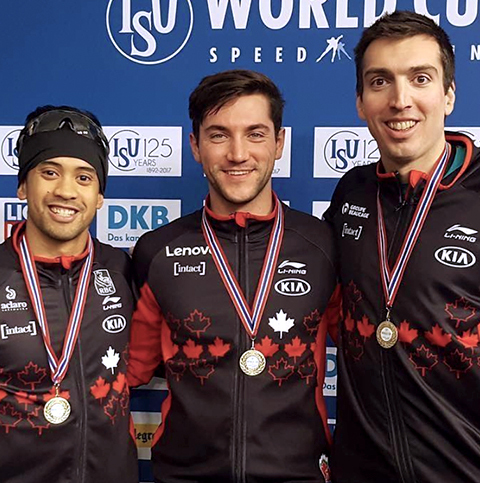 He capped the 2016-17 season by finishing second in the overall World Cup 1000m standings, thanks to his first career individual World Cup victory in Astana, Kazakhstan in December and a silver medal at the World Cup Final in Stavanger, Norway in March. Those accomplishments led to him being named Speed Skating Canada’s Male Athlete of the Year in long track. De Haître made his Olympic debut in 2014, four years earlier than he had originally targeted, after winning the 1000m and finishing third in the 1500m at the Canadian trials. 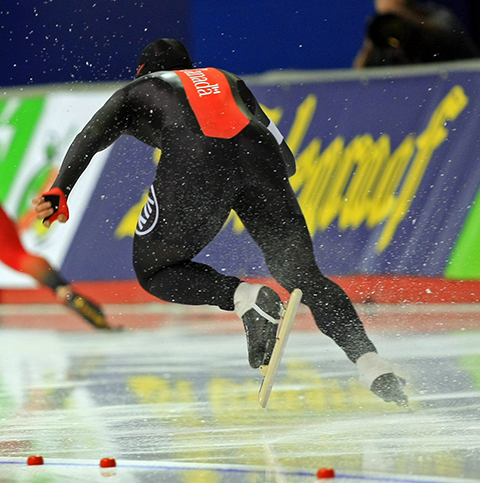 He went on to post a top-20 finish in the 1000m in Sochi and was named Speed Skating Canada’s Long Track Rising Star of the Year. At that time, he had minimal international experience behind him. He finished seventh in the 1000m and 10th in the 1500m at the 2013 World Junior Championships and made his World Cup debut in the fall of 2013. He claimed his first career World Cup medal in March 2015 when he captured 1000m bronze at the World Cup Final in Erfurt, Germany. That came just after he had competed at his first World Single Distances Championships. De Haître had been a dual sport athlete. In 2014 he competed at the Commonwealth Games in track cycling, finishing fourth in the team sprint and seventh in the 1000m time trial. He is also a former national champion in the 1000m time trial. He had picked up road cycling to help build his endurance for speed skating before realizing his aptitude for sprinting in track cycling. Can-Am International in Calgary (Nov. 15-18): He was 26th (7:03.93) in the 5000, setting a personal record. Junior World Cup in Calgary (Nov. 15-16): He was fourth in the 500 m (36.56) and 1000 m (1:11.33), third (1:49.73) in the 1500 and eighth (4:02.95) in the 3000 m, setting personal records in each distance. World Cup Final in Collalbo. Italy (Feb. 16-17): He was seventh (37.30) in the 500 m and 16th (4:10.66) in the 3000 m.
World Junior Championships in Collalbo. Italy (Feb. 22-24): He was ninth in the samalog 500 m with a 14th place (36.94) and eighth place (36.91). He was seventh (1:12.71) in the 1000 m, 10th (1:52.85) in the 1500 m and 24th (4:05.26) in the 3000 m.
Canada Cup #1 in Quebec City (Nov. 30-Dec. 1): He was 12th (39.18) and 10th (38.59) in the 500 m, seventh (1:17.41) in the 1000 m, seventh (1:58.70) in the 1500 m, third (4:20.33) in the 3000 m and 14th (7:35.35) in the 5000 m.
Canada Cup #2 in Calgary (Jan. 3-6): He set a personal record in the 3000 m with a second place finish (3:57.02), and was sixth (7:05.73) in the 5000 m.
Oval Finale in Calgary (March 6-11): He placed 32nd (36.38) and 23rd (36.09) in the 500 m, 12th (1:10.03) and seventh (1:09.64) in the 1000 m, 15th (1:48.00) in the 1500 m and 13th (3:55.94) in the 3000 m. He set personal records in the 1000 m, 1500 m and 3000 m.
Canadian Junior Championships in Quebec City (Feb. 1-3): He was second (38.72) and first (38.45) in the 500 m, first in both 1000 m (1:16.62, 1:15.81) and first (1:59.19) in the 1500 m.
Canadian Single Distances Championships in Calgary (Jan. 3-6): He was 13th (72.32) in the samalog 500 m (36.07 15th; 36.25 14th), 11th (1:10.56) in the 1000 m and 12th (1:49.21) in the 1500 m. He set personal bests in the 1000 m and 1500 m.
Final Canadian National ranking: He ranked 18th in the 500 m, 10th in the 1500 m, 11th in the 1500 m and 34th in the 5000 m.